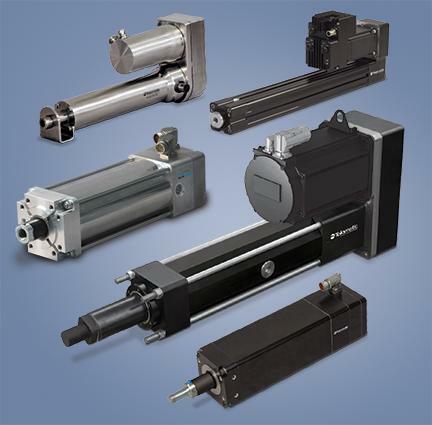 The Tolomatic family of high force electric rod-style actuators now features expanded stroke lengths up to 1.5m (60 inches), allowing more flexibility for converting motion control applications with hydraulic or pneumatic cylinders to electric linear motion. Designed for high duty-cycle performance in demanding applications, the RSX, RSA and ERD product families utilise planetary roller screws for longer service life in a compact package compared to electric actuators utilising ball screw technology. Tolomatic's highest-force actuator, the RSX, is expanded to 1.5m stroke length (from 600mm). The RSA and ERD are expanded to 1.5m and 1.2m, respectively, from 450mm. The RSX utilises a tie-rod design, provides forces up to 133.5kN (30,000 lbf) and is ideal for hydraulic replacement applications. The RSA HT is available in four sizes, forces up to 58kN (13,039 lbf) and is the most flexible product line for fluid power replacement. The ERD stainless steel, hygienic electric actuator rated, rated IP60k for applications in the food and beverage market, is available with forces up to 35 kN (7868 lbf). Tolomatic's IMA servo linear actuator and ServoWeld spot-welding servo actuator platforms are also available with roller screw configurations at various thrust ratings and stroke lengths. Tolomatic's roller screw actuator families are available with unique features to aid conversion of fluid power cylinders and maximise life, including easy re-lubrication and IP (ingress protection ratings) from IP65 to IP69k.